Somewhere within the madness, buried deep beneath cluttered chaos, lies a spark of logic. An overshadowed flickering light protects a key for which there appears to be no lock. Somewhere there’s a voice speaking words to impress the impressionable, telling those who would listen how all things are meant to be. And somewhere there sits the untold truth. White satin gently swirling in the breeze. Her murder-red hair an uncomfortable contrast to bleached flesh. Her light, a lifetime away, casts no shadow as ragged souls already lost pass her in search of newer playgrounds. They grew too old too fast. Where once they laughed and played there is silence. She calls but no-one hears. Their minds are filled with whispered promise, their hearts pound with a cold and fluid emptiness. They have long since forsaken the fragility of her magic. Trapped within the spark she smiles while her moon blue eyes weep. This forgotten child of grace bows her head and slowly moves to where she cannot see the darkness of the passing crowd. There amid the purple blooms of Everspring she sits and quietly sings while waiting for the dreamer who truly still believes. This Mistress of illusion. Her elusive touch a fleeting moment in an otherwise predictable world. Whimsical mysteries of innocence lay abandoned about while her thoughts drift to another time. It was easier then. There weren’t as many answers. No-one questioned how or why the stallion flew. It just did. It soared across a perfect sky on wings filled with the warm winds of dreams. But stallions fly no more. The winds of dreams are nothing more than cold empty spaces banished to some dark place. There are those who think only with their head. For them it is such a small world in which an existence beyond their sight is unimaginable. If they could but touch her they would feel the freedom that her soft skin holds. But they cannot touch and they cannot feel. In youth they nurtured upon her. Their minds were hungry for all that she would give. But the frenzied feedings soon grew fewer. Once they came and stayed but now some never come at all. They just pass in the darkness, over the hill…on the other side of Everspring. There will come a time when a pair of eyes eager for adventure will peek out over the soft green grasses anxious for just a glimpse of what might be. There will come a black night when the white stallion once again spreads his wings and flies into those uncharted depths of magical curiosity. There might even be a time when the pudgy dragon coughs and wheezes his way through some comedic forest in search of whatever it is dragons seek. That time may come soon or it could take forever. She lifts a memory from her feet and holds it to her chest Somewhere on the breeze the voice of a child whispers her name. She raises her eyes as a young boy climbs to the top of the hill. As he approaches she sees the tears of innocence glistening in his soft blue eyes and when he stops before her she feels the sadness of misplaced wonderment. The passing crowd failed to notice his absence. It left him behind to drown in their twisting tide of mumbles. He’s not like them. There is warmth here…and trust. Here nothing would be said. There are no words more powerful than his simply being. Their thoughts intermingle in subdued exchange and with his head upon her lap he sleeps…and dreams. A big thank-you to author J.P. McLean for including me in her blog hop. As much as I would love to continue the process I have hit a bit of a snag and, for various reasons, it appears I am to be the last twig on this branch. It’s unfortunate because this seems to be an easy way to introduce new authors and their work to a wider audience. Following are my responses to the supplied questions. While this breaks the format of the blog hop I invite any author to introduce themselves and provide a link to their blog in the comments after my post. Perhaps in some way this will also spread the word? I was born at Fort George, Scotland, in 1947, moving to Canada with my family in 1955. As an army brat I spent a decade in various locations across the country finally settling in Edmonton, Alberta, in 1964. With careers in radio broadcasting, advertising, and photography under my belt I moved to Kamloops, British Columbia, in 1994. I’m an organized hoarder with a roomful of toys/collectibles, music/movies, and books…lots of books. I watch, read, and listen to most genres depending on my mood. I’m married with three children, six grandchildren, two cats, and a rabbit. 1) What am I working on? Three things…one is an idea that came to me in a bizarre dream, another is a clean-up and compilation of poems and short prose I have written since high school, and finally the sequel to my first published book “White Wolf Moon”. That first book was easy as most of the elements and characters were fact-based thus little research was required but the sequel has been a chore. WWM also had an underlying thread throughout but the sequel hasn’t and by early critiques that seems to be a problem. I have the material but it needs a commonality other than the characters. That’s my stumbling block at the moment…the rest of the elements are all there and just waiting for a tie to bind them. 2) How does my work differ from others of its genre? I’m not sure I can answer this. It is what it is and it’s more of a character study than anything else. The characters and the dialogue drive the storyline and any narrative (other than internally from the characters) is minimal. 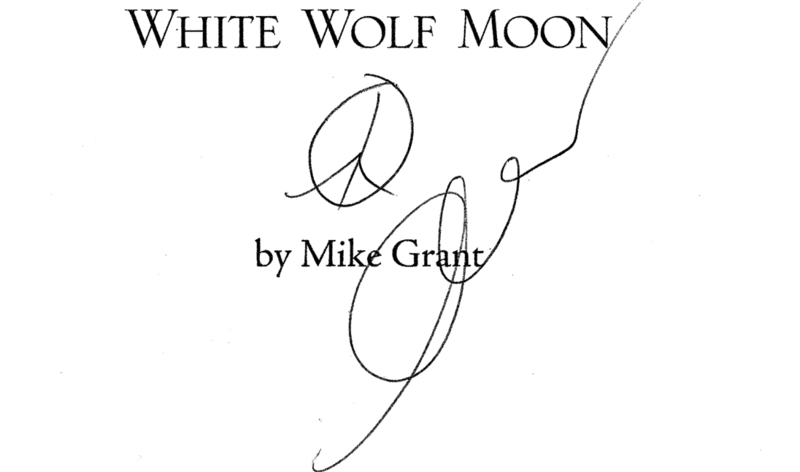 “White Wolf Moon” was a combination of light dialogue and a heavier historically-based narrative about the Sixties. A journalism student’s ongoing interview with an old “hippie” was the glue that held it all together. While the semi-fictional dialogue careened from one off-beat topic to another the interviews dealt with war, assassinations, riots, and the not-quite-so-lovely side of the Summer of Love. Perhaps this blending of fact and factual-fiction is what makes it different? 3) Why do I write what I do? The original idea for “White Wolf Moon” was more of a personal diary with no intent to publish. I sent copies to a few of the people that were mentioned in my work and they all thought that with name changes, it should be published. The real life “Danny” even fronted me the money to accomplish this. The sequel is being written for the number of readers that wanted to learn more about the relationships and quirks of the people in the story plus answer a few questions that I hadn’t realized I’d left unanswered. 4) How does my writing process work? Ah there’s the rub…the process. I write when the urge strikes me. I tried setting aside a certain time and place but this doesn’t work as well for me as running into the house and jotting down a wandering thought that camped in my head while I was weeding the garden. I also tried setting daily word count goals but I soon discovered that the quantity isn’t as important as the quality of however many words I manage to get done in a sitting. I have a digital recorder that I carry with me so that if an idea does pop into my head I can dictate it to myself. Sometimes it’s as simple as describing a person walking on the sidewalk in front of me that might make an interesting sideline character. I have occasionally recorded other people’s conversations because they have an interesting speech pattern that I might be able to give to one of my characters. I find that the time I spend observing people and places is as valuable as the actual sit down and type time. 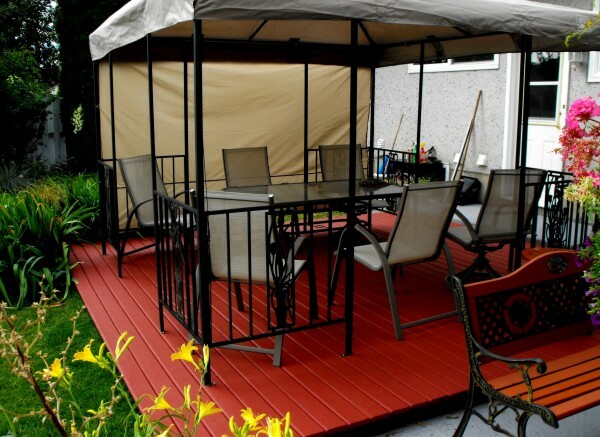 And for those that have been following my other activities over the last while…my backyard-deck is finally done! After mixing, pouring, leveling then sealing/painting the shattered concrete I built a deck over top of it all. I can now finally get back to the business of writing, blogging, and relaxing a little.